Painting is better with friends. A LD39 Submission about Sunny, the solar powered robot. A collection of scenes in a small globe. Easy Feedback brings detailed player feedback and bug reporting to your Unity game directly to you! A personal game about creating. Putting the prime in primitive since 50,000 B.C. Explore the world as it grows around you. Play as an innocent child who has just awoken to a sinking ship, on a quest to find her parents. With your monitor as your vessel, explore the world outside yours. Use your tractor beam and physics to realign planets and solve puzzles. EF 1.1.5, with the fix for this issue, is live on itch. It should be live on the Asset Store after it passes verification, shouldn't be any more than a couple days. Thanks again for reporting this one, so sorry about that! Oof, thanks for letting me know! I'll get this fixed and updated ASAP. Sorry for the delayed response! It seems I forgot to add the UNITY_ANDROID check for mobile platforms. I see UNITY_IOS there, but not Android. Whoops, sorry about that! I'll get that patched in with the next update. Thanks for bringing this to my attention, and replying with your solution! Easy Feedback Form community · Posted in TisException The authentication or decryption has failed. Easy Feedback 1.1.3 is now live on the Asset Store as well! Thanks for bringing this to my attention! I believe this was caused by a recent change to the Trello API SSL protocol. This issue should be fixed in version 1.1.3, which is live now on Itch, and is awaiting review for the Asset Store. I'll follow up here when it's live on UAS. This should be fixed in the latest version, 1.1.1, which is live on itch and the Asset Store now. Huh, that's strange. I'll look into it asap, thanks for letting me know! Alrighty! This should be resolved in 1.0.4, which is live now on itch, and should be live on the Asset Store in the next couple of days. Thanks for letting me know! I think you're onto something with them both being webviews. Thank you for writing this. I lost my grandmother to Alzheimer's when I was in my early teens, and this experience resonates deeply with me. It's very interesting that you included the anxiety over memory loss. My grandmother was diagnosed relatively early in her life, and I often worry that I am starting to lose my memory as I age. Every little thing forgotten is another reminder of her, and that one day I might become her. I've added a (hopeful) fix in 1.0.3. Sadly, I can't confirm that it works. Please let me know ASAP if you have any issues! Thanks so much for posting your solution here! I'll be adding a fix for screenshots on iOS with the next update. Thanks for letting me know, and following up with a fix via email! Sorry for the late reply! As far as I know, mobile should work, but I haven't been able to test it on iOS. Easy Feedback streamlines bug reporting and player feedback in your Unity game by bringing it directly to you! Detailed feedback and bug reports are submitted from in-game with just the tap of a button. With Trello, these reports are easily accessible and organized to your liking! Easy Feedback is very easy to setup and deploy, saving you development time, and getting your players' feedback to you as soon as possible. When a player submits a report, it is categorized and directed to a list in your Trello board based on the type of feedback. Important metadata is included along with the report. This includes: a screenshot taken the instant the Feedback Form is opened, system information (OS, CPU, GPU, etc. ), quality settings (resolution, quality level, etc. ), and a log of all messages, warnings and exceptions since the last report. All of this information is formatted with markdown on Trello so that it can be easily read, letting you focus on your game. 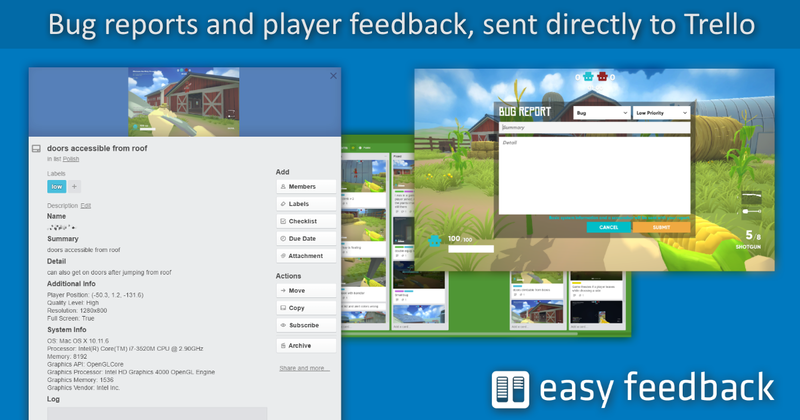 Easy Feedback is now available on itch and the Unity Asset Store! Easy Feedback has now been officially released on itch and the Unity Asset Store! A huge thanks to all of the early access developers who gave incredible and invaluable feedback during the development process. Easy Feedback wouldn't be as great as it is today without them. Last update to Early Access before release! Easy Feedback has come a long way since the project started late last year, mostly thanks to the support of the pioneering Early Access developers who supported development not only by paying for an incomplete product, but in their amazing feedback and bug reports (many of which were often fixed by the developer before I could even reply to the post!). I really appreciate the overwhelming support during development. With that, I'm happy to announce that the latest update, 1.0.0b1, is the last major update to Easy Feedback before official release on itch.io and the Unity Asset Store. After getting the last round of bug reports from Early Access developers, I'll be sending the asset off for approval and listing on the Asset Store. Right now, we're looking at an early May release. There's been lots of awesome features added to Easy Feedback since the last devlog update, and I'll be doing a series of longer, more focused, writeups for each of them in the weeks leading up to release. If you'd like information on the release as we get closer to May, consider signing up for the Easy Feedback mailing list! Sadly, there's no solid documentation yet, I'm currently working on it though! An upgrade guide is a great idea to include with the docs. I'll look into that. In the meantime, if you save your changes to the Feedback object as a separate prefab, then update the asset, your changes will persist. Just double check that you're not missing anything on the included Feedback prefab. That's a good suggestion, thanks! This behaviour can be added with quick FormElement script, but I'm adding it to the roadmap, as I agree that it should be default out of the box.